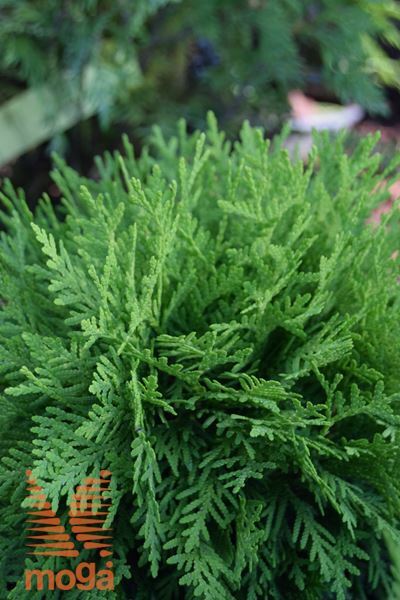 northern white cedar "Danica Gold"
Small, compact, slow growing evergreen shrub, conifer (H 0,6-0,7 m, W 0,7-1 m). Crown dense, flattened spherical, regular. Branches short, densely branched, wide open to horizontal. Needles densely arranged, scalelike, romboid to egg-shaped (0,3-0,7 cm), leathery, glossy, young needles yellow, later yellow-green to light green. Flowers and fruits not remarkable. Undemanding shrub, adaptable to different soil conditions, withstands cold, wind and urban conditoins.